If anyone hasn't already seen the up-and-coming Broadway show, "Something Rotten!" then I highly suggest you go and see it. My sister and I enjoyed it so much during our school chorus trip that we convinced our parents to go see it a second time. I don't call myself a "city girl," but I do love having the occasional outings to NYC, especially if it is to see a wonderful show on Broadway. On our way to the St. James Theatre, my family stopped to eat at Sardi's, the well-known restaurant in Times Square for featuring over 1,300 caricatures of show-business celebrities on its walls. 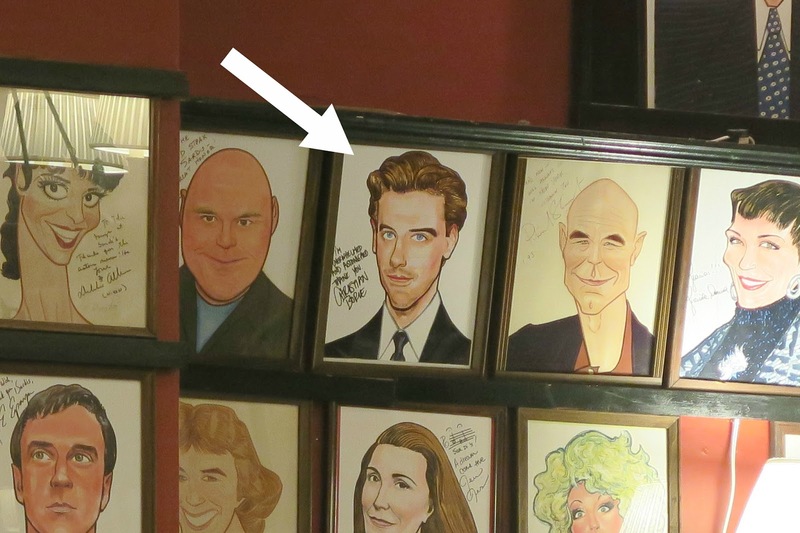 As we tried to identify as many faces as we recognized, I surprisingly identified the caricature of Christian Borle who is the Shakespeare rockstar of "Something Rotten!" Then we made a stop at "Pret a Manger," my favorite place in NYC to eat as there are many healthy options. It took 4 blocks to find the nearest one so I was grateful to see the big sign in the distance. Along with some berries, I bought a "chai chia pot". In all my time of being vegan, I've never ventured into the chia pudding world so I was pleasantly surprised to find that the chia pot wasn't bland at all, especially with the sweetness of the pomegranate seeds on top. Next time I go, I will definitely get one again. For anyone interested, my dress is a Vera Wang chambray shirtdress from Kohl's! Very soft fabric with a mixed chic and vintage look! 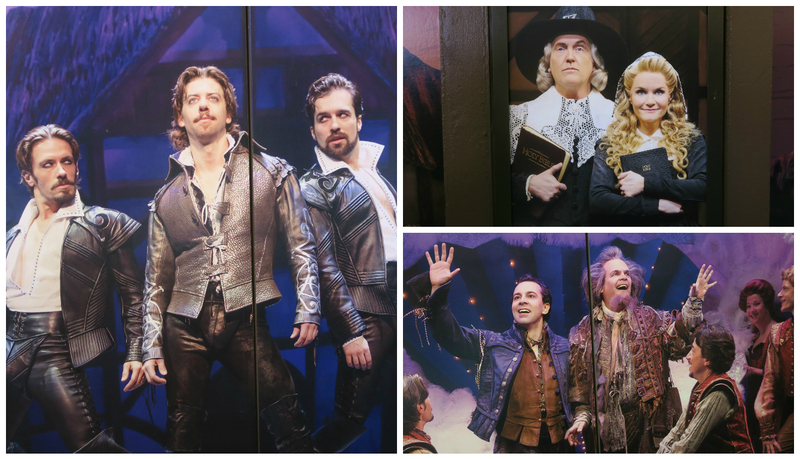 On the nearby doors, there were also pictures of the actors with in-depth reviews of the show. There's the sassy Shakespeare, the stern Brother Jeremiah and his rebellious daughter along with Nick Bottom and his sidekick soothsayer! For our second show, we got seats on the first floor, 2 rows from the back but still with a good view! So what was the real reason why my sister and I wanted so badly to go back to see "Something Rotten"? It was nothing other than being drawn to the charm and rock-star charisma of Shakespeare. The fact that his role would soon be handed over to Nashville actor, Will Chase, hastened our second visit. We weren't the only Shakespeare fans that came back as the whole theatre boomed with praise and applause whenever Shakespeare appeared on stage! Along with Shakespeare, three other actors in the cast would be leaving their roles as well including the talented Heidi Blickenstaff as Bea and the hilarious duo Kate Reinders and John Cariani as Portia and Nigel. Unlike movies where you can watch your favorite actors over and over again, Broadway is all about absorbing what's in front of you, from the curtain opening to the curtain closing, so I was very happy that we would be able to see some of the original cast grace the show before their swan song. But let's talk about Shakespeare again because, c'mon, how can you not? If you were to ask me who was the main star of the show, I would automatically say Shakespeare! "Goodnight! Parting is such sweet sorrow..."
The idea of turning Shakespeare into a McJagger-like rockstar who serenades with his skillfully composed sonnets is brilliant. Christian Borle was the perfect actor for this role because he has the natural charisma to swoon the audience. My favorite song in the show is when he sings "Hard to be the Bard." In this song, he truly gets to show how much talent and swagger he has on stage with his funny lines. I confess I do feel somewhat downtrodden knowing that I'll never get the chance to see him appear as Shakespeare again, but that doesn't mean I won't continue to watch the videos of his songs on Youtube! I'm also looking forward to seeing him as Willy Wonka in the new Broadway show "Charlie and the Chocolate Factory" that will start playing in the spring. "Pure Imagination" is very dear to my heart so I can't wait to hear his rendition of it. Even if you're not fond of Shakespeare or his works, you're guaranteed to still enjoy the show. "Something Rotten" is mainly based on a struggling bard who is trying to compete with Shakespeare, and the lengths he'll go to are sometimes quite extreme and hilarious! The bard even sings a song called "God, I Hate Shakespeare" that anyone who isn't a Shakespeare enthusiast can relate to. So why not take a short outing to NYC and see "Something Rotten"? Do a little shopping, eat at a fancy restaurant, and then take a seat at the St. James Theatre for a night full of hilarious songs and funny one-liners guaranteed to keep you laughing. If you do, be sure to leave a comment and tell me what you thought of the show! Thank you for reading my review, and have fun exploring the theatre district!